Crimean Tatar leaders and public activists addressed the audience. 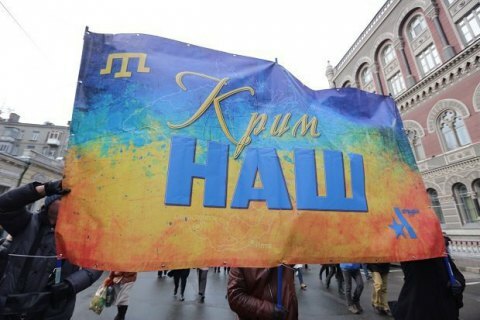 A march and a rally on the occasion of Dat of Crimea's Resistance to Russian Occupation have been held in central Kyiv, according to an LB.ua correspondent. People walked from Heavenly Hundred Heroes Parkway near Independence Square along Instytutska and Hrushevskyy streets to European Square before coming back to Independence Square where a rally was held. Crimean Tatar leaders and public activists addressed the audience. The rally issued a resolution in which its participants called on the international community to use any available leverage on Russia to stop the occupation of the peninsula. They also called on the Ukrainian authorities to be more proactive in securing the release of political prisoners in Crimea and granting the Crimean Tatar people a national and cultural autonomy in the constitution. 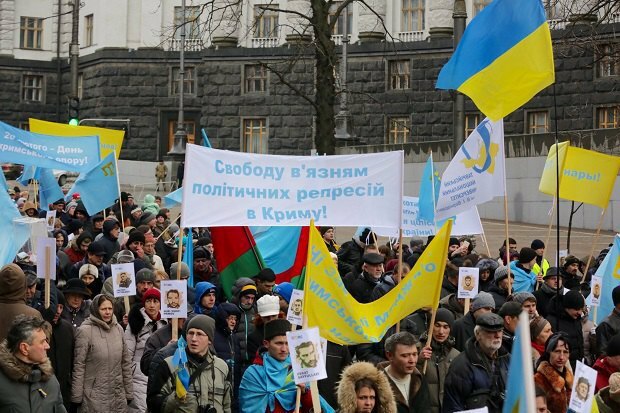 On 26 February 2014, around 7,000-8,000 people came to the Crimean parliament in Simferopol to prevent local MPs from voting for separatist decisions. On the other part of the square, around 3,000-4,000 pro-Russian activists convened on the initiative of the Russian Unity party. A brawl broke out, with two people killed and several dozen injured in the resulting stampede.